Last week we wrote about how we flipped from bearish to bullish in a span of a few days, and how we were right about our last call, albeit for a few days before it all fell to pieces courtesy of central bank inspired ire. You know what, screw all of that because we're on the sidelines. As we write, we have but a few small positions open in the market, but those are event specific plays. Bottom line, we don't see how it's plausible to bet on short and medium term moves in today's markets. Everywhere you look there is choppiness the likes we haven't seen since August last year, where the story then was about China's forced devaluation of the yuan. Looking at the volatility markets, there is no dearth of evidence that the current environment remains immensely difficult to navigate even for professional money managers. 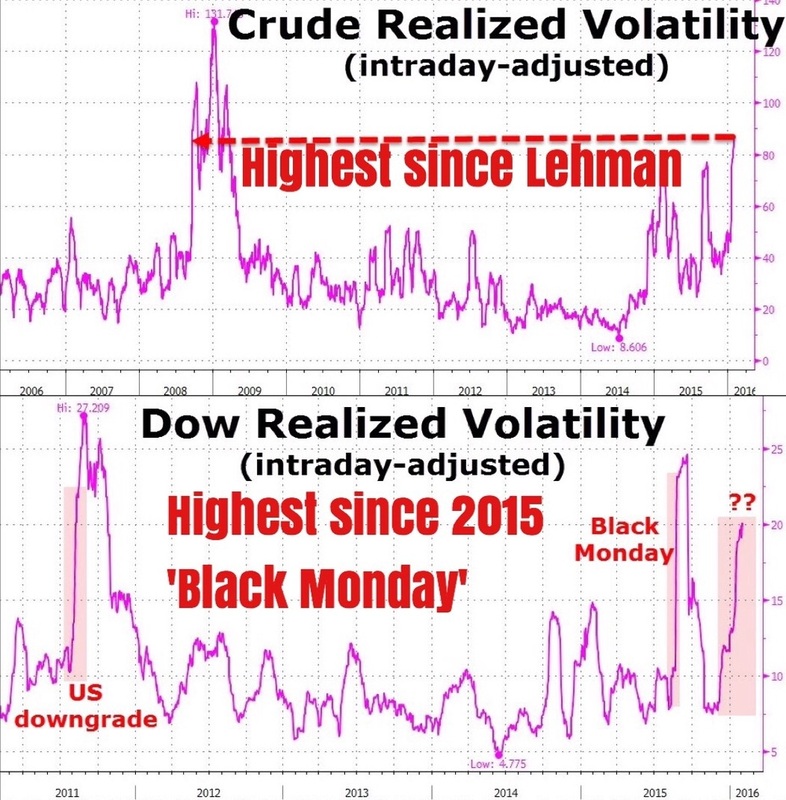 The top pane plotting the 30-day realized volatility of WTI crude oil has exploded to levels not seen since the bursting of the oil bubble in 2008/2009. The bottom pane plots the 30-day realized volatility of the Dow 30 stock index, and that too has surged to levels seen in August last year, where the so called 'Black Monday' of 2015 took place. One thing is for certain as we take a step back - ever since the termination of the Fed's QE3 program in late 2014, volatility events such as the one we're currently experiencing have gotten more common and now occur at much more regular intervals, as compared to the past when the Fed still had their QE programs running. The story this time is different. Very different and much more complex. So complex that having big directional bets will almost certainly backfire in no time. As such, we've massively reduced or exposure and adopted a preference for cash until we see more clarity as to what these dynamics want to achieve. About risk, we're slightly bearish to neutral. We don't however feel comfortable betting on either side for now. A wait as see approach is much more appropriate in our eyes. Equities are the hardest to trade. Technical traders can allude to this; charts have made little sense lately with spikes all over at illogical levels. The currency markets. That's where the action is really happening. The parabolic decline in the Japanese yen seen last Friday after a shocking BoJ move into negative rates has now been completely reversed; yes, the yen is stronger than it was last Friday! Talk about crazy moves! The yield of the 5-year U.S. treasury note is currently at major support around the 1.2% ballpark; price is at major resistance. Despite a Fed rate hike in December, the entire treasury curve has shifted downwards significantly, hallmarking an acute rush into safety as risk assets have seen incredible uncertainty and volatility. The question in our minds is if treasury yields will break their respective support areas and resume downwards, or if they'll bounce from current levels. The former would mean continued risk aversion flows, while the latter opens up another binary path of outcomes. Besides the yen, the dollar has been another high beta mover recently. There is already brooding concerns over the Fed's decision to hike rates in December last year. Atrophying economic data has led to even the most hawkish of FOMC members to doubt themselves. January's NFP report is due later today and this time, markets will be ever more intent on surfing the ephermal moves stemming from this news event. Of mentionable note is yesterday's BoE (Bank of England) interest rate decision and inflation report. For the past few months, there was one MPC (Monetary Policy Committee) member who voted in favor of raising rates (8-1 vote; 8 unchanged, 1 hike). Yesterday, this very member voted for the first time in months to keep rates steady. Inflation expectations and macro economic health has declined so substantially that even the BoE has retracted any subliminal rhetoric of hiking rates. Be prepared for more choppiness and difficult market conditions, crazy moves and wild swings that make no sense beyond the hour. Trade accordingly.